My husband has shockingly accused me of undermining his manhood in the bedroom. Years ago, when we were decorating our room, we had many a 'discussion' about the overall decor. For some strange reason my husband took umbrage at the thought of a pink bedroom with piles of soft toys in it. The teddies he bought me - I hasten to add. But no, he wanted a more manly room. "but you only sleep in there" I protested "to me its my domain, a place to get away from all of you, my little boudoir." He wasn't convinced and in the effort to be fair, we ended up with a cream and white theme. Actually very nice, but I kept my opinion to myself until I had secured all the furnishings I wanted. So we also ended up with linen that was either cream or white, until recently that is. My husband has been suffering with his back and shoulders this year, he's had lots of aches and pains. Giving me lots of opportunities to tease him about his age (he's 11 years older than me). I'm the older and more responsible one in this relationship, if he ever 'grew up' it would be a travesty. Anyway, because of his aches and pains my mum reminded me about what they do in Norway. When we lived there, the double beds had single duvets on, so each person could snuggle themselves up and there were no gaps or in our case, sometimes no duvet at all. We both seem to spend the night having a subconscious tug of war in which, if I lose - I'm cold, and if he loses - he cant move the next day. So I bought the single winter duvets. But I had no covers. I hadn't wanted to buy new ones in case we didn't like the arrangement, so I simply used some I found in the back of the linen cupboard. 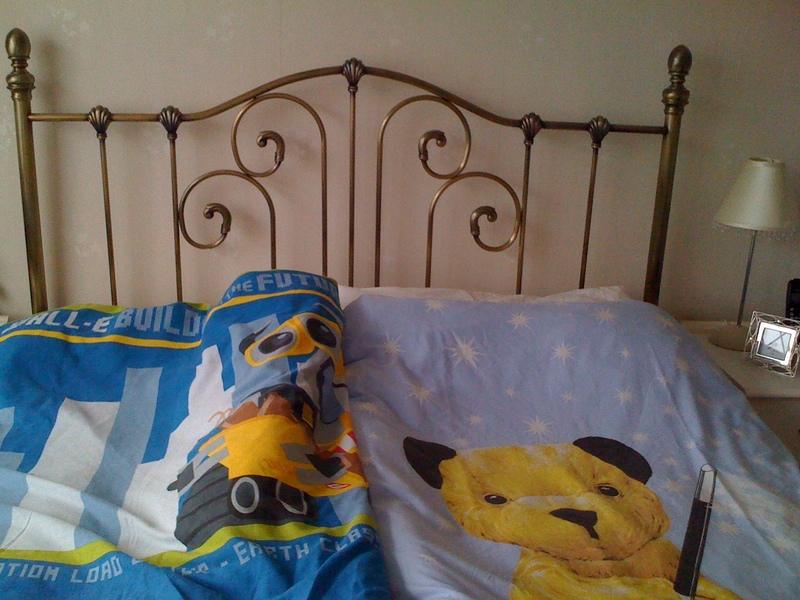 He got Wall:e and I had Sooty, these were duvets the kids had long grown out of but I hadn't got rid of. Waste not want not, I was simpy recycling. When hubby saw our room, he was quite put out and kept reciting 'what will the window cleaner think, we have a child's room and the kids have grown up rooms'. 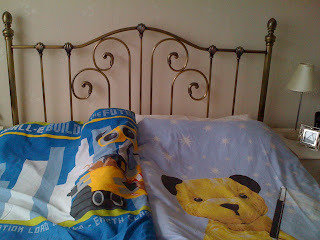 He sulked all evening eventhough I had explained I would get proper single duvet covers if we like sleeping like that. We did, its great, I would really recommend it. He spent the first night doing a very annoying Wall:e impression. "cream or white covers dear?" I asked him this morning.